Chile was rattled by another powerful aftershock Sunday, one of at least 10 to strike the country in the aftermath of yesterday’s 8.8-magnitude earthquake. The latest aftershock struck the capital of Santiago at roughly 8:30 a.m. local time, less than 36 hours after Saturday’s mammoth temblor damaged some 500,000 homes and left an estimated 1.5 million Chileans affected by the disaster, the Associated Press reports. The death toll stands at about 300, however officials caution they expect that number to climb. Chile’s ambassador to the U.S., Jose Goni, described the devastation as “enormous” in an interview with NPR. As Chile raced to respond to the crisis, officials in Hawaii breathed a cautious sigh of relief, canceling a tsunami warning. Nearly 50 countries and island chains, including Japan and the Philippines, however, remained on alert for large waves triggered by the quake. “Luckily, these waves are far smaller than the agency’s forecast,” Kazuaki Ito, director of the Information Institute of Disaster Prevention, a Tokyo-based nonprofit group that advises on natural disasters, told the New York Times. Meanwhile, back in Chile, some of the worst damage appears to be in the city of Concepcion, approximately 70 miles from the quake’s epicenter. Police there have reported more than 100 deaths, with scores more trapped below the now crumbled city landscape, according to media reports. There are also sporadic reports of looting as residents seek out food and other necessities. Concepcion’s mayor, Jacqueline van Rysselberghe, said the situation was getting “out of control” due to shortages of basic supplies, Reuters reported. “We’ve got a very complicated situation and the people feel very vulnerable,” she told local radio. Nearby in Talcahuano, a giant wave spurred by the quake flooded the port city, parking large fishing boats in and around the main square, according to the Times. In the coastal region of Maule, as much as 80 percent of homes have been destroyed, according to government officials. Many died in the wreckage of their own homes. “Unfortunately, we found whole families buried in the rubble,” Alejandro Boettiger, a firefighter in the Maule region, told the Wall Street Journal. Watch raw AP footage from the aftermath of the quake entitled “Chileans Wake Up to Destruction” here. It comes to us via the Washington Post, which has a live Twitter tracker of tweets related to the Chile earthquake. 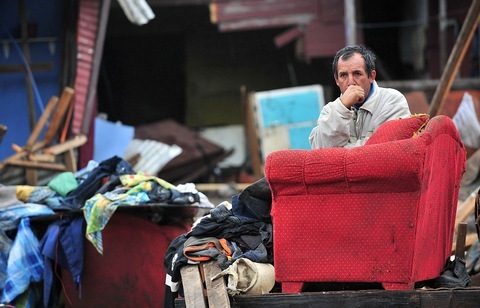 For now, international aid organizations are on standby awaiting a request of assistance from Chile’s government. The country has yet to formally request help despite offers of aid from the U.S., China, the EU, and the U.N., among others. Saturday’s quake, the fifth largest since 1900, was stronger than the 7.0 magnitude tremblor that rocked Haiti in January. However unlike in Haiti, where an estimated 220,000 lives were lost, far fewer have died in Chile in part because the quake hit further below ground, and also because of stricter building codes. Nevertheless, the destruction in Chile is enormous. The New York Times offers this slideshow of the damage, as does the Washington Post, the Wall Street Journal and National Geographic. The BBC has this slideshow, as well as this video of the moment the quake hit.